A nice image of the the burren, I struggled there, not an easy place for me to photograph and get anything I was excited about. My humble attempt at something similar in Scotland is over on the landscape forum. Yours is less cliché. Not a typical treatment, like it. Does this shot really require 4 exposures? With D800, would a single exposure not be enough for the same result? So much detail into how the pic was taken but no mention of whether any colour adjustments were needed. Apparently it's rude to ask so I wont. Must have missed the memo but when did photographers get so precious? Another day another sunrise... He's right. It's a cliche. Lots of people do portraits. I guess they're cliche as well. It’s obviously a sharp original—the snappy microcontrast is evident. But I find the overlapping sunstars along the horizon distracting. Nice but a bit boring, look like déja vu 1 million times. In 2017; the only photos of landscape than i find interesting are the one made by drone, who give new possibility on composition. How many more of those drone shots can you see before *they* become boring clichés as well? And do they lose artistic value at that point? For me, shots like the one above are timeless. Humans have been witnessing sunrises since the dawn of mankind, and I like to think the way we enjoy them hasn't changed over the ages. Just sit back, drink in the light and the shapes, and (IRL) the wind the sounds and the smells, and feel ready for another day. That's what sunrises are about for me, no matter how many times I live them personally or see pictures of them. I have never experienced a similar connection to life from a drone shot, even though I can certainly appreciate them for artistic merit. Once you have seen a few drone shots, they become boring as well. One of the best works that I saw 20 years ago was a A2 size photo collection that had about 200 photos taken from airplanes over all kind different terrains by using a IIRC medium and large formats. After that every aerial photo has been to me a faint reflection of that collection. The sunset/sunrise theme is very easy as one can produce a hundreds different looks from exact same position and same natural time but in different season and weather. Boring? Not fair. That critique could apply to almost every image we see because there are so many of them. We are bombarded by images and everyone walks around with a camera these days. The internet, social media, emails, websites ... You name it, images are everywhere. Nothing special about most landscapes these days. I know professionals who have quit because of this. Lovely picture and the cut down original is plenty sharp. I had a holiday in Ireland and stayed very nearby on the coast. One morning I awoke very early and although it was about 5 am I got my mother up, she having travelled with me, and we rushed out to a treat, a beautiful sunrise over 360°. I use a Nikon D610 and mostly the same lens. Even my style is similar, most of my shots being into the sun, though usually more into the day. It is not that I consciously seek that out but my subconscious certainly does. Nothing special. Photo not even sharp. My opinion. And you clicked it and saw the bigger photo? And you understand that the bigger photo also is downscaled? And therefore the sharpness of the original photo is unknown? What is with people and constant comments on sharpness of reduced images? It looks impressively sharp for a 1MP image. Very nice. It doesn't matter here what the content is, it is just the gear and the technical performance in theoretical manner. @Tommi - you are a bit unfair. Most here understands that you cannot judge the sharpness of an image from a small picture. Most do. But some will still rage on about it. Had Reilly Defenbach here attacking me about sharpness...calling me a liar about producing a sharp 16x20. Why? Because he was looking at a tiny image compressed to 394k...and making a judgement call from that. Seems like an epidemic here. Hmmmmmmmm ... maybe we are visiting different fora. I have of course seen it, but except for this thread, I cannot remember when. So, an epidemic I would not call it. But, enough of this. Back to something more fun. Most at DPR don't understand that you can't judge the sharpness of the lens nor the focus before you put the photograph to context, in its final presentation medium. If someone does 8x10-12x15" prints then there is totally different definition what is sharp between lenses and files. Compare that to just a 4x6" and the scale is again totally different. Compare those two to 25-40" wide prints and the scale gets narrower where lens (or file) is considered "sharp". Yet here at DPR the DPR itself writes about lens sharpness and ranks lenses by sharpness and people go around merry wheel about sharpness without the context "what is required to get sharp photograph". And that is twisting majority of the recommendations and help given to new camera owners, buyers or just gear buyers, because almost no one is asking the most important questions "For what medium?" when topic is about "sharpness". Almost always you can't judge image/lens sharpness from digital file! That is a fact! When I don't see any detail in my images when they are downscale I don't post anywhere. I do not know if you know the difference between resolution and sharpness. This is mainly a technical site with technical forums. Most pictures here have high resolution. They are often made with cameras with lots of pixels with good lenses. And I assume this goes for this image also. If you look at the original it probably has lots of details. Now, you have a point. And that is sharpness. This is not an image forum. So we usually do not bother to do any extra sharpening when downscaling. This might make images look soft. Sharpness is not resolution, it is local contrast at the limit for your eyes resolution. There might even be some sharpening halos that you cannot see, if you not are looking very close or have very good eyes. I guess, that it is this sharpening you miss. This sharpening needs to be adapted for the actual presentation of the image. I actually kind of prefer the smoother, less crisp images, sometimes. The same people who comment about sharpness and such I imagine would be the same people who would comment that the Sistine Chapel is just another painting. J/K. That's a great part of the island. Not quite like anywhere else. Nice picture. The small image on top of this page is quite bland. Nothing to write home about. The bigger image you get when clicking it is beautiful. A typical example when size is everything. I am missing some clouds in the upper left, but you cannot get everything. BTW - nothing is happening in this image. It is kind of empty, except for the sun rise. No animals or birds or people or houses or boats. I can even imagine there is no sound either. Except maybe the wind. There is some mist over the water far away. You can feel that it probably is chilly. I agree, this is an image that really needs to be viewed full size to be appreciated. An immersive, tranquil scene with beautiful lighting and a nice change from the drone shots, blurred waterfall cliches and dramatic mountain scenes that typically dominate the genre. 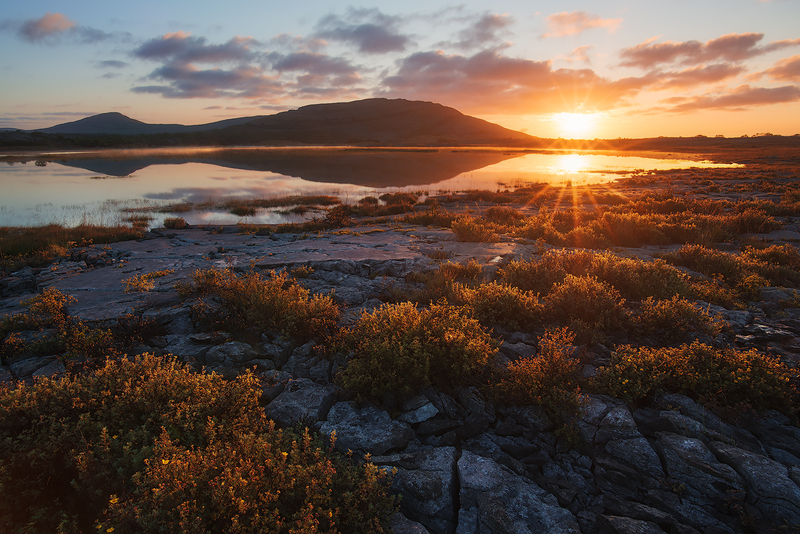 I think the presence of animals, people or bulidings would detract from the wonderful wilderness feeling of the image, but rest assured, the Burren is very rich in wildlife and flora - particularly rare insects, herbaceous plants and lichens. I also agree with this. In this image the emptiness is everything. Normally emptiness means boring. In this case it tells the story. Landscape photos typically look better bigger. anticipation - Yes that's true to a degree, and it applies particularly to wide-angle shots. Often a telephoto landscape is best viewed at a smaller scale. It has more to do with the focal length/angle of view, than with the subject being photographed. Yepp ... I found for film that you can use a more wide angle lens for large format than for 35 mm. It is like you need a certain resolution per angle, or something. Small wide angle images looks unimpressive, often. Roland - I shoot a few landscapes as wide as 17mm (FF) but I much prefer to use longer focal lengths in the 100-300mm range. No pimples on the horizon for me, I like my mountains BIG! Agree. The new software that is out makes all landscapes suspect. Most will be fake in a few years. You no longer have to wait for the good light, you just create it. Very sad. I don't like it as there's no Leica equipmnet based. Classic composition, nice color and highlight and shadow detail. Nice highlights on the plants. Nothing bad to say about this image. It's all good. A good but forgettable shot. Good composition but the colors are bad - too reddish in the highlights and the rocks are too bluish. Skip the class on complementary colors? I knew it! There is a scientific explanation why I should like something I do not. Nope. Just a scientific explanation for why some things look better together. Even when they do not? Very well, go troll the person who made complementary colors. Rocks are in the deep shadows, only getting the lit up by the sky, that is the deep blue color that shades shadows. And in many sunsets the highlights are burning red... Challenging for cameras as red channel clips easily first. Nothing wrong with the colors, or maybe you have wrongly calibrated display or you just have different taste or simply you have wrongly calibrated environment where your color calibrated display exist (ie, if you have green plant next to your calibrated monitor, then you will suffer from wrong colors on screen). @LightBrush14: Can I use your trolling lines? I like the way the composition encourages the eye to wander the scene. The first thing I see are the plants in the foreground, followed by that sunburst, and then I naturally look over to the hills in the background with their lovely, reflected curve. A good landscape shot (to me) is often more than just a subject in front of a background; it’s about the scene as a whole, and it rewards the lingering eye by revealing beauty and complexity that maybe wasn’t apparent at first glance. This picture does that. Last week was "bad" and this is an average sunrise/sunset shot????? i think this is an excellent picture. Alot of work behind taking this image. Is that barrel distortion, or just the curve of the shoreline itself? I think it’s just a perspective thing that causes the shoreline to look bent, since the sides of the lake are closer to the camera and therefore lower down in the frame. It’s not a true horizon line although it looks that way at first glance. Agree. Also, an actual horizon would look curved (with such WA) anyway. albert - its highly likely that the lake shore line is not straight. It's a small lake and therefore going to be curved. It looks like a curved lake to me. I do agree that the shoreline is curved, especially on the right where it needs to curve back to the viewer. But I also think it is possible there some barrel distortion contributes to the curve, especially since the high point is dead center and the shoreline is in the upper portion of the composition. In any case, that curved shoreline does grap my attention because it seems a bit unnatural - but of course it could be totally natural. As a side note, to get around this illusion it is not uncommon for me to frame a composition with the horizon in the center to keep it straight, then crop about 1/6 off the top or the bottom to have the final result be less static and follow the 1/3 composition guideline. Massive step up from the bizarre choice of last week which looked like it'd been taken with a 2010 smartphone. Moderator, please delete this moron's comments. No, but I am tired of the peanut gallery disparaging fellow photographers (assuming you are a photographer). Are you a refugee from the Off-topic forum? Last week's photo story was Fire and Ice which seemed like it went over pretty well with the community. It was a great image in my opinion. You're right. Very nice that one. I was referring to the one two weeks ago - I am Legend. I see now they have adjusted the title for the last two weeks, adding "story". Interesting change. Rick - The moderators would be better advised to delete posts which include personal insults such as "moron" and "peanut gallery", which serve to do nothing but provoke escalation and alienation. It is perfectly possible to make a point without resorting to rudeness! damian - Yes, the change from "photo" to "story" is interesting, and befits the detailed, informative and helpful comments made by the photographer. Well worth reading. This guy's attempt to get the moderators to censor this comment is a very worrying and, frankly, childish trend that I have been seeing on the internet lately. It's so comically unnecessary. What did he say that deserves a ban? Nothing. You just don't like what he said. But that doesn't mean he doesn't have the right to say it. Having the right to say something, and having something to say, aren't precisely equivalent. @Entoman, I am trying to draw the moderator's attention to what I see as a problem that is escalating. Posting vicious insults of gear is one thing but insulting a fellow photographer's work in this unsolicited manner is another. Both the OP's comment and mine would have been deleted in any other discussion forum. @Internet Enzyme What is childish is your understanding of the Rights of Free Speech. The best forums have heavy moderation. The internet is full of angry people who lash out and add nothing to the conversation. And free speech has absolutely nothing to do with writing on a privately owned website - I wish people would start understanding this. Pete, Internet & Rick- The problem is that dpr looks at forums simply as a way of generating clicks to the website. The forums would be a far nicer place to visit if commentators learned some self-restraint, and if dpr introduced a higher level of moderation. There is nothing wrong with robust debate, but there is far too much unnecessary rudeness here that quickly escalates and makes the forum unpleasant. Entoman -when the original post is made with gloves off, or an obvious troll -it's fair game to respond in kind. You know this. You're blaming the wrong party. Of course it's not a constitutional issue of free speech. But it is a test on whether one believes in the principal of the idea. On almost every single thread I have ever been on, moderation has not fostered any better conversations. The best moderators are the ones that only ban spam and bots. Deleting comments just because they offend you or because they are of bad taste is stupid. Let the commenters debate in the marketplace of ideas. I really see almost no reason to delete a post as long as the commenter is following the law. Moderation keeps the discussion on topic and coherent. If several people are discussing something of interest, and another guy comes on and starts making inane comments, the discussion is derailed and ruined for everyone else. I have no problem with him making those comments in an off-topic forum or his own website. How do you pick your weather when you’re out hiking, though? My experience has been that usually all you can do is get to the right place at the right time of day, and just hope for good conditions. If it ends up being an overcast day there’s not much to be done about it. But then, I’m a hobbyist and my hikes and photography have to happen around the rest of my life. If it’s cloudy on the weekend, I can’t just hang out in the woods until Monday when conditions will be better or postpone my hike until mid-week. I go when I can go, and just try to get put myself in the way of good opportunities when they happen to come along. I’d love to have the luxury of camping out on a peak (or wherever) for a week, waiting for that perfect day, but reality gets in the way. I stick local and take a mental note of when and under what conditions and at which angle a scene would look best. Then when I get those conditions I “find” an hour to take some pictures. photofisher that’s a good point and I do have a few favorite local spots that I go back to from time to time when I think the conditions will be good. And long term, I intend to move somewhere where the scenery is a bit more dramatic than it is where I live. By and large though it doesn’t help me to check the weather ahead of time, because it’s not like I can do anything about it! I just keep revisiting the same place. I know that some people really don't like going to the same place twice but, whatever, if I want that shot badly enough, I'll visit a hundred times (maybe). May be cliché, but things become cliché because they work. And it takes a lot of planning and work to get a landscape shot with both good composition and lighting. Lovely shot. I must go there myself some day.